Orders will be processed for delivery within 24 hours of payment being processed. Orders will be dispatched on for delivery on the same business day if payment is received before 12pm, if payment is received after 12pm the order will be dispatched the next business day. For next day delivery, orders will be sent using a 24 hours signed for service. Orders placed after 12pm will be dispatched on the next business day for next day delivery. Xtar Direct UK do not take any responsibility for delays caused by disruption to postal services that are out of Xtar Direct UK control. Xtar Direct UK reserve the right to deliver your goods for up to 30 days after purchase. If Xtar Direct UK are made aware of a delay then Xtar Direct UK will contact you and offer another option for delivery or a full refund. We take responsibility for the goods until they have been received by you. Cancelations: Xtar Direct UK offer a right to cancel policy from the date of purchase to 28 days after receiving the goods. Should the goods be delivered in more than one shipment your right to cancel is from when the last batch of the shipment is received. Xtar Direct UK must be notified in writing of your request to cancel before the 28 days after receiving goods. A full refund including postage cost to you will be given no matter what the reason for return is, if the product is returned in new condition or has no evidence of use. Xtar Direct UK reserve the right to give a partial refund for goods that show evidence of use. Subject to the above, we will refund the purchase price of a returned product within fourteen days of receiving the returned product. We recommend that all returns be sent a signed for service, so that a record of the return is available for you. We recommend that the service includes enough insurance to cover the cost of the goods being returned. We will refund the postage cost incurred posting a defective product, incorrect product or a inaccurately described product when using a standard signed for delivery methos, we will not refund the postage costs of any express element of a courier service such as Royal Mail special delivery. Our products have a 24 months warranty against manufacturing defects. Any goods which are subject to a warranty claim should be returned to Xtar Direct UK for inspection. Please notify us in writing, (email, letter or using the returns request form) and state the reason for the return. Xtar Direct UK will repair or replace the defective product, should the product be discontinued Xtar Direct will replace with an equivalent or better than equivalent product. The warranty does not cover accidental or deliberate damage, acts of god, damage caused by incorrect use, use outside of its parameters, has been modified in anyway, has been repaired by a none Xtar Direct UK engineer or a Xtar Direct UK nominated service engineer. Xtar offer refundable return costs for manufacturing defects for up to 2 years but should the goods be received are found to be in working order we reserve the right not pay delivery costs for inbound or outbound goods. 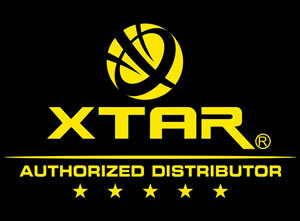 Xtar Direct UK do not collect, store and have no access to customers credit or debit card details. For your security and peace of mind, we will not supply your details to any organisation for marketing purposes. We will store personal information such as name, address, telephone number, email address for the following reasons: delivery, returns, warranty claims. We will not send you any marketing material by post or email and we will not call you on telephone for marketing purposes unless you request to receive news of promotions and products by signing up to our news letter.